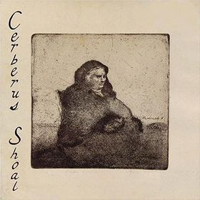 Cerberus Shoal ia a RIO/Avant Prog collective that has been around since 1994 (forming in Boston) and has released 14 albums up until 2010. Their lineup has changed a lot, which is why they consider themselves a collective. Their self-titled, debut album consisted of Caleb Mulkerin (guitar, vocals) who relocated from Portland, Chris Sutherland (bass, vocals), Thomas Roger (drums) and Josh Ogden (guitar). The album was also reissued on CD in 2004. This album actually has a more post rock feel to it with the use of dynamics and twin guitar riffs, and the building of themes through repetition and intensity, but in the case of Cerberus Shoal, the intensity changes are usually quite quick. The album begins with the first track titled 'Rain' on the album. It is a mostly easy going track with a moderate tempo which suddenly gets quite intense when the dual guitar riff comes in after 1 minute. Everything calms again a minute later as we are left with just the bass finishing off the short track. 'Daddy as Seen from Bar Harbor' begins heavy, cools off after a minute as subdued spoken vocals come in surrounded by a heavy beat and strong bass with a start/stop pattern on a tricky meter. Just before the 5 minute mark, everything gets suddenly louder when full guitar power kicks in. At 8 minutes, the music quiets down with the introduction of a smoother rhythm and a more melodic vocal, that still remains somewhat subdued while the spoken vocals continue further in the background. A quick crescendo just before 10 minutes cranks up the intensity immensely as the melodic vocal turns to shouting. 'Elena' is a softer track with a steady mid-tempo beat and more of the spoken word vocals mixed in at a lower volume. 'Change' is more dynamic with a soft, almost minimal beginning that interchange with louder sections, vocals still mixed down low that are more spoken than sung, but become close to screaming on the louder sections. 'Breakaway Cable Terminal' continues with the same dynamic soft to loud feel, but in a less formulaic way and with a more melodic vocal at times, but with screaming on the louder sections. The second track titled 'Rain' comes next, and is hard to tell what the tie in to the first track is, but it continues with the soft / intense pattern as before and the soft spoken word and screaming vocals. The track listing above shows that this track is 39 minutes, and this has caused some confusion as it is actually just over 5 minutes. There is then a bit over 4 minutes of silence before an untitled track begins. A bass line repeats while percussion and a drone play which is joined by a melodic guitar later. Everything intensifies quickly for a while and the pattern repeats with differing feedback drones. This pattern just repeats for the rest of the 29 minute track with some variation in the instruments, but no variation in the rhythm or bass line. The sound of this album starts out well enough, but after the first two tracks, the loud and soft pattern tends to grow old and there is very little change in the vocals or sound from one track to the other. Even though there were a lot of strong reviews with this album, I don't see what the draw is to it since there really isn't much change in the sound. Yes, it was early in the days of post rock, but even then there were better bands and albums out there. There were times when the band were much better, so I guess we can give some slack to them since it was their first album, but this debut album just doesn't expand on the basic sound enough.